According to a founding legend, the name "Luxembourg" dates back to the time of Siegfried in the year 963. Said Siegfried had his castle "Lucilinburhuc" built in honor of the mermaid Melusina on a rock called “Bockfiels”. 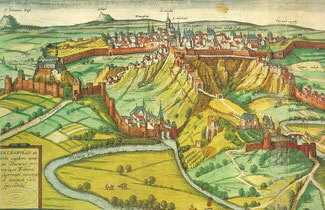 From the name of the castle the name "Lützelburg" evolved over time and later the present name "Luxembourg". Below the castle a castle settlement developed gradually, which was surrounded by an enclosing wall. In 1354 Luxembourg became a grand duchy.